You can make your kitchen look modern by applying gel stain on the cabinet doors. You either pay a professional for this or you can go ahead and accomplish the task yourself. Fortunately, working with gel stain will be fairly easy if you have some basic painting skills. Here is what you will need in order to gel stain cabinets and cabinet doors so that they look darker, eventually adding to the decor of your kitchen. Before you apply gel stain on the cabinet doors, you will need to remove all the cabinet knobs (or pulls). 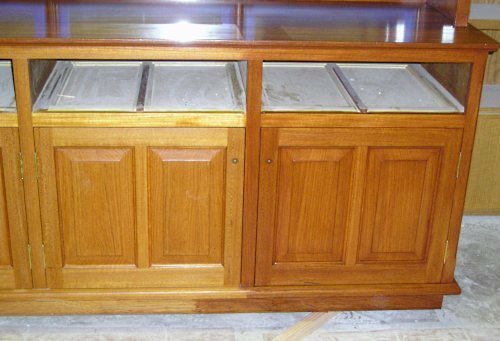 This will ensure that the knobs or pulls do not get stained while you stain the cabinet doors. Set aside the knobs. Use a screwdriver to remove the hinges which are holding the cabinet doors in place. It will be easier to remove the hinges if someone holds the doors while you are working on the screws. Place the doors on a workbench such as a covered patio. Now you need to clean the doors and the cabinets to remove any accumulated dirt. Use an all-purpose cleaner or degreaser. Scrub down the doors and the cabinets and allow time for them to dry completely. If you feel that the doors and cabinets are still not clean, repeat this step at least one more time. Prepare the doors the cabinets for staining by lightly sanding them with fine-grit sandpaper. Avoid scrubbing too much; instead just sand lightly. You can make the sanding task less messy by using liquid sandpaper. Wipe clean the doors and the cabinets with a clean cloth to remove wood dust and shavings. To avoid the wall edges directly adjacent to the cabinets from getting stained, cover them with painter’s tape. Apply a uniform, light coat of gel stain on the cabinets and the doors. Allow about 3 to 4 minutes for the stain to set in. Wipe off excess stain with a piece of clean cotton cloth. Allow at least 24 hours for the gel stain to dry completely. You can make the doors look darker by applying another coat of gel stain, the same way as you did before. Finally, apply a coat of polyurethane sealant to seal the finish of the doors.